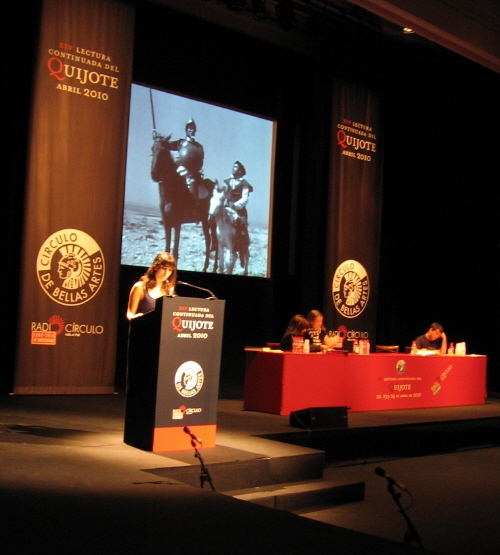 Each year, to commemorate the official day of Cervante's death on April 23, the Circulo de Bellas Artes hosts a Continuous Reading of Don Quijote de La Mancha. It takes about 48 hours. Celebrities, students, and volunteers off the street each proclaim a brief excerpt. I've volunteered twice. In 2008, I read a portion of Part Two, Chapter XVIII, which included a verse of very bad poetry. In 2010, I read a portion of Part Two, Chapter IV, only one sentence, but it was 122 words long. Here are my accounts from each adventure. I took part in the 12th Annual Continuous Reading of Don Quixote today. It's held in the Hall of Columns theater on the 4th floor of the Círculo de Bellas Artes, a cultural institution in downtown Madrid. Anyone can volunteer to read a few paragraphs, so why not me, despite my accent? I went up to theater lobby, got my volunteer number, and went into the hall. About 100 people were inside, listening as one reader after another took the podium on the spare and dramatically lit stage. A monitor on a wall announced that they were reading from Book II, Chapter 18, which deals with what happened to Don Quixote in the castle of the Knight of the Green Doublet. A camera crew filmed the reading for close-circuit TV throughout the building, and a radio technician monitored the live transmission on Radio Círculo 100.4 FM. A movie screen showed clips from movie adaptations of the book. An interpreter presented the words in sign language. Volunteers came in all types and ages. Three men read their sections in Esperanto. Entire families read. Young children stumbled but bravely made it through their paragraphs. Don Quixote is a funny book, and some readers couldn't help smiling as they read. Everyone got a brief round of applause when they finished. "Verdaderamente, señor Quijote," dijo don Lorenzo, "que deseo coger a vuestra merced en un mal latín continuado, y no puedo, porque se me desliza de entre las manos como anguila." "No entiendo," respondió don Quijote, "lo que vuestra merced dice ni quiere decir en eso del deslizarme." de lo que será después!..." ("Verily, Señor Don Quixote," said Don Lorenzo, "I wish I could catch your worship tripping at a stretch, but I cannot, for you slip through my fingers like an eel." "I don't understand what you say or mean by slipping," said Don Quixote. For the past 14 years, to celebrate the anniversary of Cervantes' death (actually, his interment) on April 23, the Círculo de Bellas Artes of Madrid organizes a marathon reading of Don Quijote de la Mancha. Each volunteer reads a short portion of the work. I volunteered in 2008 and again this year. I arrived today at the Círculo de Bellas Artes, a seven-story cultural center in downtown Madrid, a little before 10 a.m. on a warm, sunny spring day. The sidewalk and the lobby were bustling, and TV news crews busily recorded the scene. I recognized two prominent Spanish politicians on my way to fifth-floor Hall of Columns where the reading was taking place. April 23 is World Book Day, and a cultural center was the place to be seen. I registered in the lobby outside the hall. Some readers and groups pre-register, and some like me walk in off the street. The volunteers handed me my volunteer-off-the-street ticket, Number 176, and apologized. "It will take a long time to get to that number, an hour, maybe more." One of them pointed out an electronic display board and explained that they were all over the building including the cafés. He said they would alert me when my number was coming up if I wanted to go relax elsewhere. I said I would enjoy watching the reading. He apologized again because the hall, with more than 100 seats, was filled to standing-room-only. But I had read two years ago and expected all this. I went into the hall and found a comfortable place to stand. The brightly lit stage held a table and lectern. Above it was projected an old movie version of Don Quijote. At the dimly lit sides of the hall, technicians managed equipment for Radio Círculo and Instituto Cervantes TV, and staff organized the readers waiting to go on stage. On the podium, high school students were reading the sonnets at the end of Part One with varying degrees of confidence as their friends in the audience snapped photos. Each volunteer read until the woman who was assigning the readings said "muchas gracias." Then the reader stepped off the stage to applause, and it was the next volunteer's turn. At the start of Part Two, Chapter II, the Cervantes Institute connected to its Pekin branch, where three people active in Spanish literature – Dong Yanshen, Fan Hong Yu, and Xu Ying – each read a section. They spoke Spanish with good accents. The reading returned to the Hall of Columns. A few VIPs slipped in among the students, along with some volunteers from the street. At the start of Chapter IV, Radio Círculo connected to the Madrid Women's Penal Institute, where two inmates read. At 11:15, my number came up. I signed in, and then sat next to the woman assigning the readings. She followed along in a large-print text as the person ahead of me read. When he reached the end of a sentence, she said, "Muchas gracias." It was my turn. The book on the podium was the same large-print edition. My section began with the words "Yo, señor Sansón" halfway down the page in the middle of a line. I found it and began reading with as much inflection as I could, though I was reading only a half-word ahead of where my finger was following the text. I reached the end of the long sentence. "Muchas gracias," the woman said, and I stepped down from the stage to applause. I remained to listen to Chapter V. Most of the high school students had left. The Ambassador of Ireland read a few paragraphs; so did another VIP and a lot of ordinary people. 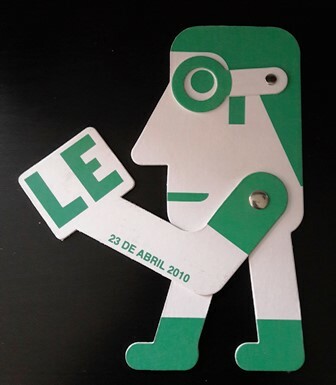 When I left the hushed hall for the busy lobby, the Guild of Madrid Booksellers gave me a commemorative paper doll. Downstairs, at the even more busy main entrance, a television displayed someone reading from Chapter VI. Sixty-eight chapters remained. "...Yo, señor Sansón, no pienso granjear fama de valiente, sino del mejor y más leal escudero que jamás sirvió a caballero andante; y si mi señor don Quijote, obligado de mis muchos y buenos servicios, quisiere darme alguna ínsula de las muchas que ha de topar por ahí, recibiré mucha merced en ello; y cuando no me la diere, nascido soy, y no ha de vivir el hombre en hoto de otro, sino de Dios; y más, que tan bien y aun quizá mejor me sabrá el pan desgobernado que siendo gobernador; ¿y sé yo por ventura si en esos gobiernos me tiene aparejada el diablo alguna zancadilla donde tropiece y caiga y me haga las muelas?..." This is so charming, for so many reasons; what an excellent tradition! Good on you for getting up there to read, and how cool that you got such an excellent paragraph. "my bread will taste as good and perhaps even better without a government than if I were a governor"
... ooh, pretty dangerous talk for those times, wasn't it? I guess since Cervantes was already in jail, he didn't have to worry about being thrown in jail. Is nascido soy an idiom? "I was born so" with the 'to suffer' implied? The book had passed through the censor Gutierre de Cetina before it was printed: "It contains nothing against the faith nor good behavior, rather it is a book with much licit entertainment mixed with much moral philosophy." And by then Cervantes was long out of jail. He had been held for about four months in 1597, and the first part of "Quixote" was published in 1605, the second part (from which this reading comes) in 1610. He was still poor as a church mouse, though. And yes, "nacido soy" is an idiom, "I am born (to suffer)" "I am resigned (to the fate I was born into)." "Deslizarme" seems almost onomatopoetic to me. That was exactly what I thought too. What a great word! This page was loaded Apr 24th 2019, 9:08 am GMT.